Melanie feels guilty about the way she's treated Kelvin. Dorothy reports Kerry to the Department of Community Services. KERRY: Why are you doing this to me? DOROTHY: I've absolutely nothing against you, my dear. However, I do care a great deal about the welfare of children. KERRY: But I've done nothing wrong! DOROTHY: Perhaps not from your point of view. But from mine, the set-up here is unacceptable. KERRY: But I love children. I mean, we get along extremely well. DOROTHY: Being able to get along "extremely well" does not give you the credentials to take care of young ones! You need a higher level of maturity for that. Joe comes back in and can't believe what he's hearing. JOE:(to Kerry) She been having a go at you? JOE: Look, I've had enough of you. Who do you think you are, coming in here all high and mighty, putting us down, who do you think you are?! JOE: I want you to leave. Get out of here now. DOROTHY: Very well. But I assure you, this is in no way personal. Josh is still trying to hack into the Education Department's computer to get the questions for the quiz. Todd and Melissa have given up hope and are studying for the quiz instead. 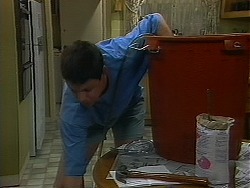 Joe is in the kitchen, looking for sugar for his beer brewing. Kerry is still upset about Dorothy - she wonders if Dorothy is right, and that she's taken on too many children to look after. Joe says that anyone who thinks Lochie is an angel has to be half-mad anyway(!) Kerry is worried that she might be breaking the law after all - she'd better check it out. She's got a friend on the council and she'll sound her out. Beverly is on the phone about doing some lecturing. Todd is exhausted, and despite his protests, Jim sends him to bed. 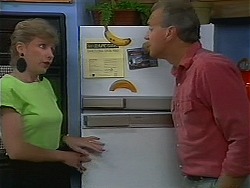 Beverly comes off the phone and tell Jim that a colleague wants her to do a series of lectures based on her latest paper. 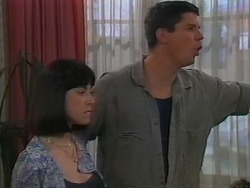 Jim isn't very impressed - Beverly agreed to scale things down, and now she's going to carry on just as she was before. Gloria is musing about having an Irish week. Lee isn't keen - she doesn't want to dress up again. Lee is a bit jumpy. Dorothy comes in. Gloria tells her she's glad that she liked the soup the other day. 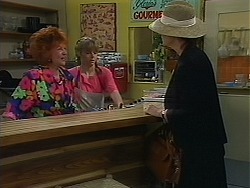 Dorothy doesn't blow Lee's cover (bless her) and orders a coffee. Kerry is on the phone to her friend at the council. Apparently Dorothy was right - it is against the law to mind more than four kids. Also, a pre-school advisor is coming to check up on Kerry. 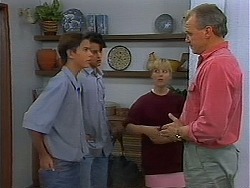 Also, Dorothy told them about Lochie breaking her arm and the kids chaining themselves to the playground roundabout. Kerry is worried that the advisor will think she's negligent or incompetent. JOE: Oh, look at this. There's an ambulance in my beer! Todd is fast asleep - he's been studying in his lunch hour. Jim thinks he's over-doing things with the cramming. Jim thinks one of them should talk to the Principal of the school about the strain of the quiz, but Beverly can't see the problem. Anyway, she's too busy too do it. They start to argue again. In the kitchen, Lee brings in a bottle scotch that she's found on one of the tables. Gloria says it belongs to a guy called Max who's a mate from the Waterhole - he'll be back later. Lee warns Gloria that she shouldn't let anyone drink alcohol at the Coffee Shop - it isn't licenced. Joe is siphoning the beer into bottles. He makes a mess and accidentally knocks all the bottles over! Todd, Melissa and Josh come in. 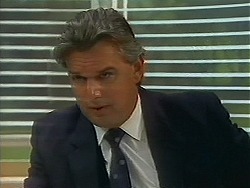 Jim tells Todd that he's made an appointment to talk to the headmaster - he thinks the quiz is too much strain. Todd is horrified and tries to put him off, but Jim won't be put off. Todd tells Josh urgently that he's better hack in and put his report back the way it was - if the straight A's one is still there, he's sunk. 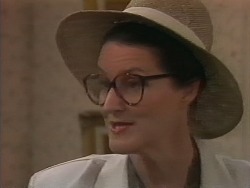 Lee is still distracted - she tells Gloria that she's got a lot of hassles, for example, finding somewhere to live. Gloria asks if Lee and Matt are OK, but Lee doesn't want to talk about it. Kerry comes in and she and Lee talk privately. Lee tells her about feeling pressured physically - Kerry says the only thing that's worked for her is just to get away from the person doing the pressuring. Josh is trying to hack into the school but the line is engaged. Dorothy is in the headmaster's office, telling him her ideas for the school very forcefully(!) He shows her out and shows Jim and Todd in. Jim explains that the quiz is a big strain on Todd. He can't see the logic of Todd representing the school in his weakest subject. The headmaster is surprised - they always pick the strong students to represent a certain subject area. Josh has finally managed to hack in, but it's not working the way it's supposed to. The headmaster tells Jim that Todd is a straight A student, much to Jim's surprise(!) Jim explains that Todd got a C in Science. Jim says the headmaster must have got Todd's file mixed up with someone else's. The headmaster is new, so he doesn't know Todd personally - he's never had straight A's in his life! Melissa screams at Josh to get the grades sorted. The headmaster says he'll call up Todd's report on the computer to check.